Welcome back to the In-App Purchase Inspector - our regular look at free-to-play games from the consumer's perspective. In each installment, we consider the incentives or pressure applied to make in-app purchases, their perceived value, the expansion offered by IAPs and the overall value of the experience. The end goal will be to see whether the game makes a good enough case for us to part with our cash, or whether players are content - or engaged enough - to freeload. This time, we'll be taking a look at Kabam's Fast & Furious: Legacy, a glossy tribute to the ever-popular street racing film franchise. Fast & Furious: Legacy is much like the film series it celebrates: bold, fun, but not especially groundbreaking. You play the part of a young rookie on the street racing scene, blowing away more experienced drivers and working your way up the ranks by driving nicely-rendered cars really fast through nicely-rendered cities. It's by no means a racing sim, though, more a collection of short challenges interlinked by dialogue between established series characters. In a new addition to the series, sometimes the camera is behind your car, allowing you to switch lanes, Subway Surfers-style, to dodge police, while in other stages it's the standard genre side-on camera and you'll be tapping to change gears in a drag race. 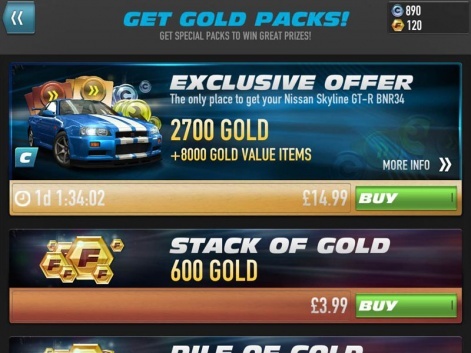 Fast & Furious: Legacy is a game that wants you to spend money. This approach does prevent things from getting too stagnant during long play sessions, but it's also a structure which relies more on car power than skill. Every now and then you'll hit a brick wall and have to upgrade your vehicle, and this is arguably the real meat of the game. Fast & Furious: Legacy is a game that wants you to spend money, and is pretty upfront about that attitude. The hard currency here is Gold - with prices ranging from $4.99 for a stack of 600 to $99.99 for a stash of 17,000 - and while it is released in a trickle throughout the game's story mode, many of the mechanics present a fairly overt push toward spending. Let's begin with the game's energy system, which here manifests itself as oil that needs changing every 5 races. As discussed previously, with the brief snippets of gameplay which comprise each race, it doesn't take long at all for your car to be out of action. Wait times are over two hours long, encouraging avid players to use Speed Up Tokens to hurry things along. It's certainly an interesting idea - rather than simply charging a single fee to complete the process early, you're instead offered access to various degrees of acceleration with Speed Up Tokens ranging from 15 minutes to 4 hours. You've given a handful of tokens to start with, which is a nice touch - psychologically this is known as reciprocity - and a few more as a reward for joining a crew with fellow players, but soon they'll run out and you'll be left with no option except spending hard currency to alleviate the issue. The good news is that you can house up to 12 different cars in your garage, so if one is unavailable you can always call upon another. However, new cars don't come cheap either, and may not even be up to scratch if you've been piling your upgrading efforts into your primary ride, as most players will. The process of buying new cars is inspired by the card-collection genre that is a random process: an Amateur Crate could yield anything from an E-class Honda to an A-class Chevrolet, while a Pro Crate reduces the risk slightly by guaranteeing a car of class D or higher. The higher a car's class, the more powerful it is as standard. Sure, you can upgrade a class E car up to a decent level, but it will be a longer road than if you started out with a class A. That's right. 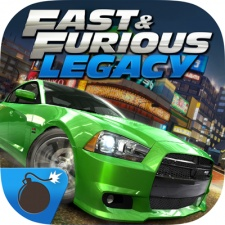 As with most F2P games, skill will only get you so far in Fast & Furious: Legacy. The difficulty of a race dictated purely by your car's power. A race whose difficulty was only moments ago described as 'Impossible' will suddenly change to 'Easy' if you spend some currency upgrading. 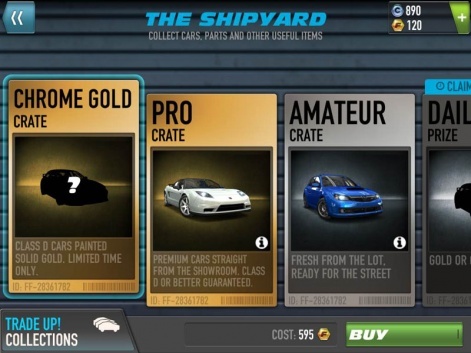 However, it is the price of these crates which could present an obstacle to the average player, with the Amateur Crate and the Pro Crate priced at approximately $4.99 and $9.99 in real cash respectively. To earn that currency through grinding would take a long time, too, especially with only a starter car and the energy system tripping you up every few minutes. You'll also be confronted with limited-time offers occasionally, tempting the player with the promise of something special and exclusive. These are seemingly for dedicated players only, such as an exclusive Nissan Skyline GT-R priced at $19.99. Here, money is exchanged for bragging rights. I made a comparably small investment early on, anticipating that I'd need to sooner or later, and this seems to have been a shrewd investment if you fancy breezing through the opening chapters and aren't too fussed about being challenged. 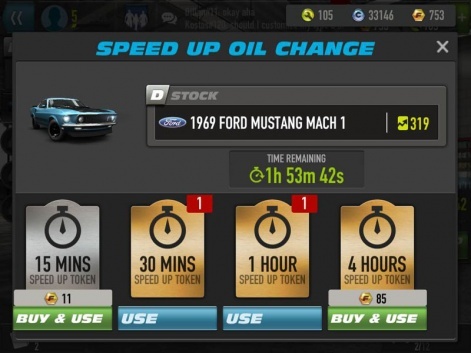 Spending $4.99 on an Amateur Pack, the 1969 Ford Mustang it provided had me reliably beating out rivals by 4 to 5 seconds. But all good things must come to an end, and soon enough rivals will begin to close the gap. This is where the importance of upgrading comes in. Upgrading existing cars is a far more player-friendly process than buying new ones, which to be fair is a luxury rather than a necessity if you're happy to play in short, regularly interrupted bursts. 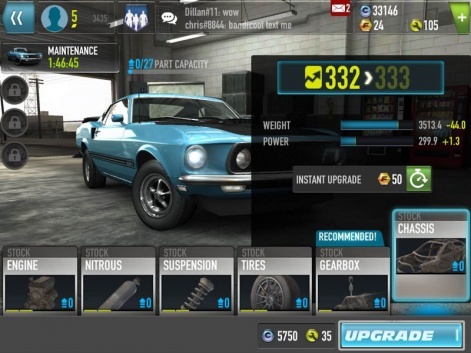 Coins and Upgrade Points, rather than Gold, are the currencies used to tune up your vehicle, and these are given out much more readily in standard play - as rewards for winning races, primarily. You can still spend Gold to perform an instant upgrade, and to buy the missing Coins and Upgrade Points if you're running low, but it's nice to see Fast & Furious: Legacy giving players at least a partial relief from monetary pressures. It is this decision to monetise the upgrading system less heavily that makes its other sins more forgivable, and ultimately saves the game from alienating non-paying players. It presents a way to progress without spending money, albeit an avenue of grinding repetition, and assures players that they're not being priced out of the game. How does PopCap's CCG debut Plants vs. Zombies: Heroes monetise?